The Knysna Basin Project launched the Artful Waste Challenge during last year’s Knysna Oyster Festival. What does this challenge entail, you might ask? First, an estuary clean-up takes place, where teams walk along the Knysna estuary and collect litter (or shall I say art materials) lying around. Once this is done, teams use the litter collected to find their artistic side and create pieces of art with an environmental message. The teams with the best artworks are then rewarded with awesome prizes from our sponsors (Metelerkamps, Ocean Odyssey and Knysna Elephant Park). Fig 1: The Vullis Steyne busy collecting litter along the Knysna estuary. But what is the reason for hosting this event? The world is faced with a litter, and especially plastic, epidemic. Eight million tonnes of plastic is dumped in our oceans each year. In 2015, humans have created an estimated 6.3 Billion tonnes of plastic since 1950 – and of that only 9 % has been recycled, 12 % incinerated and 79 % is still in our environment (Geyer, Jambeck, Law. Production, use, and fate of all plastics ever made. Science Advances. 2017). Studies suggest that, if we continue at the present rate, by 2050 (that is only 33 years from now!) there will be more plastic in the ocean than fish. Plastic is now present in all our ocean environments – from the deep sea to the coast to the high seas to our very own Knysna estuary. Fig 2: A keen Waste Warrior from SANParks, helping out during the event. Fig 3: Participants of the Artful Waste Challenge. The Artful Waste Challenge is a miniscule attempt to open the community of Knysna’s eyes to the tremendous litter and plastic problem we have created as a species. And if you think it is not your problem, you are sadly mistaken. And if you think you as a single person cannot make a difference, you are again sadly mistaken. Fig 4: The teams were provided with extra litter to use in their artwork – all litter was collected from Brenton Beach. By hosting this event, the Knysna Basin Project wants people to firstly, see that litter and plastic ends up in our beautiful estuary, and then, by collecting the litter, seeing and realising where it goes from. 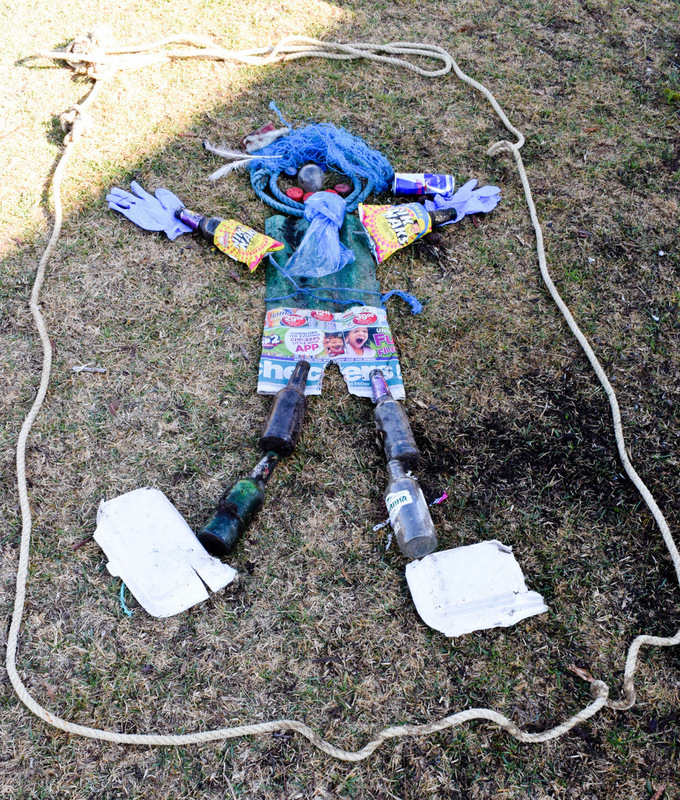 As the teams create art by using the collected litter, thought is put into what we are actually doing to our environment and its inhabitants when we litter. Fig 5: The Rubbish Rangers created Rusty the Rubbish Ranger! Fig 6: The winning team, The Trash Terminators, with their prize sponsored by Metelerkamps. We will host the Artful Waste Challenge again next year during the Knysna Oyster Festival and we hope to see more locals participating – helping us to spread the word. For now, I hope this message will resonate with every single person that reads this – it is your responsibility to consume less, make the choice to use less plastic (particularly packaging – your green peppers or onions do not have to be in a bag! ), say no to single use plastic (what is the use of a straw anyway?!! ), to recycle, to do beach and estuary clean-ups and to spread the word! Fig 7: We hope to see you at the next Artful Waste Challenge next year.